Hairstyles are something which is essential and yet so much complicated when there is no time at hand. Hairstyle not only defines the looks but also the personality of an individual. But, most of the times due to rush and a busy lifestyle, it is simply not possible to take much time to style the hair. At that times so, many people must wonder and wish if there was a simple and quick way to style the hair. There are many styles of quick hair. In fact, there are some tricky ones which can transform the look within seconds and it does not even look easy. 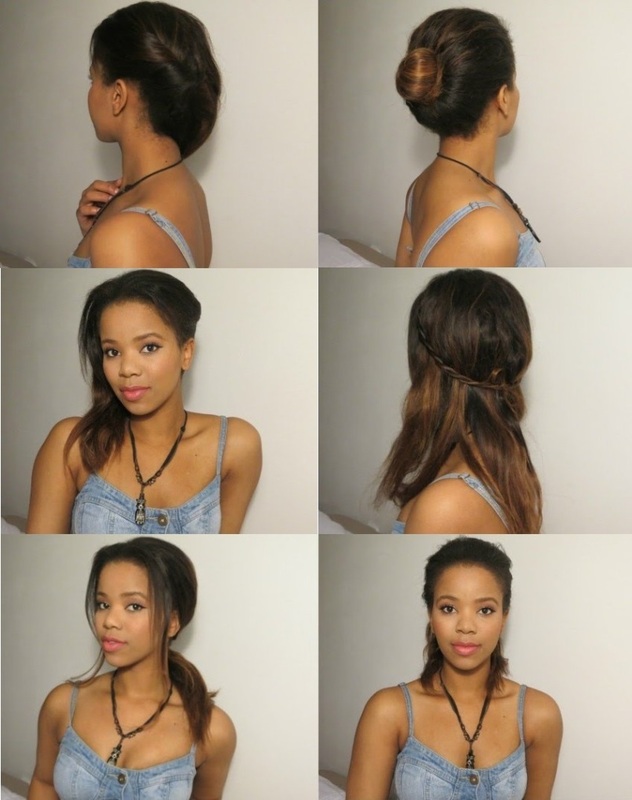 Get your perfect look at the following DIY hairstyles that will just take 10 minutes. Quick Hairstyles are very much convenient for all. They are time saving and trendy as well. Moreover, the time saved on the hairstyles can be utilized elsewhere. Normally, hairstyles take much time to make. Whether the hair length is short or long, quick hairstyles always come in handy. There are many hairstyles which look sophisticated but take so much less time to make. Such hairstyles can be easily done. For a total makeover, there are many other things apart from hairstyle which have to be done. So, the minimum time must be utilized for doing the hairstyles. The knotted low pony looks super sophisticated yet is so easy to achieve. This hairstyle can be done in a jiffy. The hair is kept messy and casual. Length of the hair is long. Due to the casual hair texture, this look is more natural and yet so elegant. The hair is pulled back lower at the neck and the loose ends are tied in loose and casual knots. The entire hairstyle is kept messy. This style can be worn with any casual yet elegant dress as well. The hair length is long. The texture of the hair is thick which makes the messy crossover pony so much trendy. The hair is kept casual. The front strands of the hair are taken and twisted at the back. A low ponytail is made at the lower back of the head. The twisted strands are crossed over and under the low ponytail and secured tightly. The hairstyle is very easy to make and yet the look is so chic. The light blonde Medium Length Layered Hairstyes and center-parted are very quick which almost take no time to achieve. The blonde hair is parted in the centre. The hair ends are made wavy. The look is so casual and yet looks classic. It can be easily worn with any formal wear for a party or any casual outfit. The light blonde hair brings out the hairstyle more prominently. If the hair length is medium short and the texture of the hair is fine, then there are a lot of last minute quick hairstyles on can opt for. The hair can be neatly combed and gelled to one side of the head. A bun is also a safe option. A neat bun looks classy and also takes no time to make. The hair can be partly left open in the front or locks can be pulled free. Or, a thin braid can be made with front few strands and secured with a clip. If one is short on time, these easy and time-saving tricks can give beautiful hairstyles within moments. A double pony can be done to add volume to the hair. The reverse French twist pony is yet another easy style. The hair is pulled back into a twisted pony and the ends are kept open in this style. The messy bun is very easy to do and is made chic with a headband in the front. The easy Boho braid is a bit of bohemian style which can be done in a jiffy. The hair is made wavy and roughly parted on the side. The front few strands from the parting are taken and made into a casual braid. The hair is left open so that a casual and chic look is achieved. The hair strands are perfectly messy and the hair color is also highlighted in combination strands. For long and thick hair, the hairstyles are very common. For a quick one, it can be done into a ponytail. Only the ponytail is made with a little variation. The front strands are messed up and roughly added to the back of the ponytail. The ponytail is made high and trendy. Though the look is messy, the hair strands have been pulled out of the face and into the ponytail. The curly hair can also be styled in so many ways. In fact, the curly hair looks so natural and trendy that it can be styled very easily. Taking a few strands of hair from the front, it can be pulled back and secured at the back of the head. The front portion of the head can be teased a little bit for a chicer look. This Short Hairstyle can be worn with a casual or a semi-formal dress. The romantic side braid takes lesser time to do than any other trendy side braid hairstyles. The front locks have been kept open. The hair is kept straight and neat. Length of the hair is quite long. Taking small sections of hair from the front and from the back of the head, a neat braid is done at one side of the head. The trendy side braid is done neatly and the entire hairstyle is kept neat. The ponytail is the simplest and easiest of styles which can be done within moments. Also, it can be carried with any kind of dress whether casual or formal. The hair is casually parted on one side of the head. A thin and low ponytail is done. Taking thin twisted strands of hair from the sides, it has been secured under the ponytail. The twisted strands are neatly wrapped around the pony. The entire style is kept so neat and trendy. The hair length is long which brings out the hairstyle. The bow in the hair adds a fresher look to the entire hairstyle. Also, the bow is easier to make too. First, the hair has to be combed neatly. Slightly wavy and long hairs make the entire look more classic. Taking two thin strands from the front portion of the head, a neat bow is made at the back of the head. The bow is tied securely at the place and the rest of the hair is kept open. This hairstyle can be easily worn with an elegant and casual dress. The DIY knotted hair is for all the women who want to style their hair in a trendy way in the shortest time possible. The long hair is parted on the side. The entire volume of hair is taken at the back and pulled into a loose ponytail. The loose ends of the ponytail are made into a bun. With a slight tweaking and pulling of the hair strands, the bun is made to look elegant. The front few hair strands are left open. This is a casual yet elegant hairstyle which is easy to make. The curly hair is very easy to do and is particularly suitable for the working women. for making the easy curls, the long straight hair is made into a high ponytail and divided into two halves. Both the sections are curled separately and then left open. The hair is slightly parted on the side so that the curly locks gather to one side of the head. The half up faux hawk is a very trendy hairstyle which can be paired with any bold and elegant dress. It looks sophisticated and yet is so easy to make. The hair is divided into three sections. The top and the side portions are twisted and turned to make a casual messy braid. The braid end is secured with a rubber band. Rest of the hair is left open. The length of the hair is long and it is thick. This hairstyle looks best on hair which is straight.